Martini, my new ShaoYin mare, has been with me for about 3.5 months. She seems to be happily settled in. I have found it can sometimes take 6 months to a year for a horse to be comfortable with a change in location and/or ownership. During this adjustment phase a horse can exhibit personality traits that are not in alignment with their true temperament. This is also a time when physical symptoms can occur secondary to emotional stress, changes in feed, management, training style or climate. When Martini first arrived into Pagosa Springs, Colorado from Elgin, Texas she was a bit timid and unsure of what was expected of her. My mare, Cerise, really helped teach her the ropes but, unfortunately, Cerise was put to sleep just after only a few weeks. Losing Cerise was another shock to both Martini and our gelding, Tanq. Both horses seemed confused and uncertain about who was now in charge and how things would be with just the 2 of them. It took a month or so for them to sort everything out and, luckily, they did this easily and without any altercations. They decided that Tanq eats first but other than that they share leadership. Martini did develop a couple of symptoms during her adjustment period. She developed a dry cough with the change in climate from humid to dry. I gave her WellPride fish oil and her cough completely resolved. The WellPride oil is high in omega 3 fatty acids and has a mild anti-inflammatory action. I still have Martini on it and her coat is wonderful and her hooves are getting less brittle. Martini also developed loose manure. Her appetite stayed good and she was not in any discomfort but her manure stayed more like a cow patty. I gave her Ration Plus prebiotic but after 30 days I did not see much change in her manure. I have had Martini on 1 TBS of the Fire balance formula since she arrived and this has helped her relax but did not change her manure. I now have her on 6 bifidus a day and the manure is beginning to be more formed. It may just be the difference in hay that she is adjusting to. The bifidus really helps with fiber digestion. I did not ride Martini for the first month with all the upset from her move and losing Cerise. When I did ride her she was well behaved and obviously trying so hard to please me. When I asked for something that she did not understand she would chomp on the bit. Now she realizes that she will never get in trouble for not understanding something and she has pretty much stopped all the chomping. The Fire balance formula has helped lower her anxiety. She is happy to go out on trail rides by herself or with Tanq being ponied along. I haven’t trailered her anywhere but that will come soon. I have enjoyed the process of helping Martini settle into her new life in Colorado. The ShaoYin horse can be easily intimidated and a bad experience can affect them for life. I am blessed with a ShaoYin who has been handled well all of her life and because of this she is a very friendly and dependable horse. 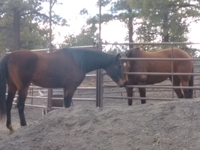 This entry was posted in Five Element Feeding, Five Element Personality Typing, Five Element Training, Newsletters and tagged horse temperament, horse temperament types, Horse Training, Shao Yin on July 15, 2018 by Madalyn Ward, DVM.